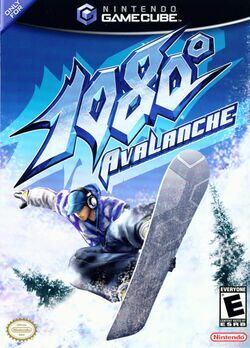 1080° Avalanche is a snowboard racing game for the Nintendo GameCube. It was developed by Nintendo's in-house development studio, NST and published by Nintendo. Avalanche was released on December 1, 2003. 1080° Avalanche is a sequel to 1998's 1080° Snowboarding for the Nintendo 64. It supports up to four players and also supports LAN play with up to four GameCubes. Sometime in 1999, it was confirmed that a sequel to 1080° Snowboarding was coming to the Nintendo 64. Rather than Nintendo handling development of the game, they passed development on to second-party studio Left Field. When the game failed to materialize, it was confirmed that the game was no longer being produced for the N64, but for the Nintendo GameCube. Not long after this announcement, it was also confirmed that Left Field was revoking its status as a second-party studio so it could develop multi-format titles. Development of the game was handed to Nintendo's American development studio, Nintendo Software Technology Corporation (NST). They originally planned to call this game 1080°: White Storm, before finally renaming this game to 1080°: Avalanche. It is assumed that the game was completely rewritten by NST, but it's possible that some elements of Left Field's work remains. No real story exists within the game besides some sort of competition; the background information on the characters is only available in the instruction booklet. However, the booklet alludes that the characters are at the mountain together, where they are there to show off to see who's the best. See the Characters page for such information. This page was last edited on 8 October 2007, at 23:00.